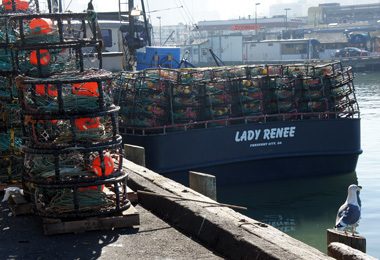 Every November, fishing boats pack together at San Francisco’s Pier 45, where crews stack the decks with row after row of mesh crab traps. This year, a new fishery policy means those stacks are a little smaller. Central California’s crab season is typically fast and furious, in which 80 percent of the haul comes in the first four to six weeks. 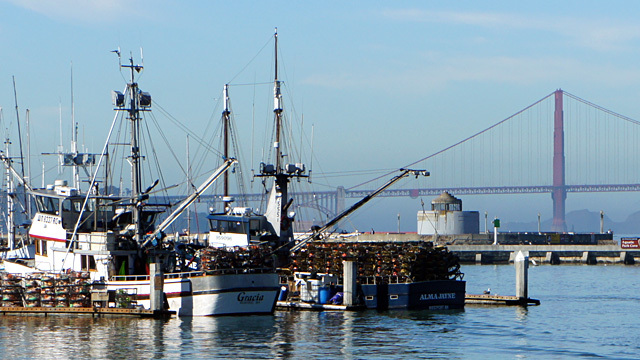 Previously, boats could carry an unlimited number of crab traps and local fishermen are typically joined by boats from Northern California and Oregon, because crab season opens two weeks later north of Mendocino. Under the new fishery limits, each boat is allocated 500 crab traps or less, based on its historic catch. Oregon and Washington have similar limitations in place. Kalvass says West Coast crab fishermen will now be on a level playing field. Since the cap is on the number of traps, not the volume of crabs landed, the trap limits could conceivably extend the crab season, meaning consumers would see fresh crab in markets longer. “Typically, as the season wears on, the price that the fishermen get increases, so it was thought this would be a benefit to the fishermen,” says Kalvass. Fishermen are hoping to match last year’s record-breaking catch, when 31 million pounds were landed in California. Fresh crab should begin arriving dockside late Friday.